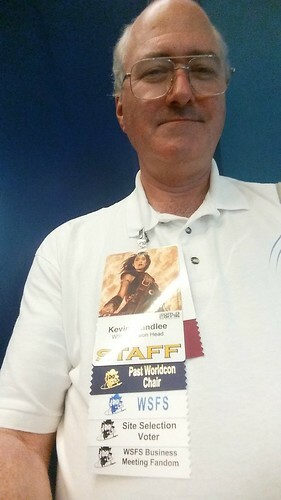 It was a very busy day today on the first day of Worldcon 76, and I just don't have time enough or energy enough to write about it all, not if I want to get sleep tonight. After the morning division heads meeting, I set out to try and find the various WSFS ribbons that I'd ordered for the division. 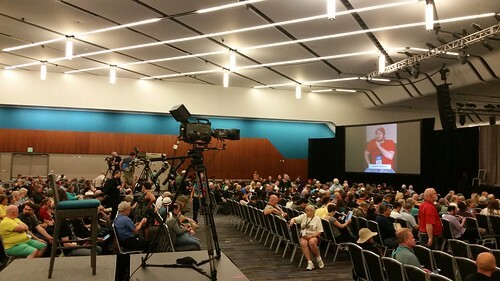 I'd been to the convention office several times but nobody there had known where they were. On this trip, the person who knew where the WSFS box was located was in the office and I signed off on them. After collecting my own ribbons (pictured above), I took the various piles of ribbons to where they needed to be and handed them off. It was a little later than we wanted, but we got it done. 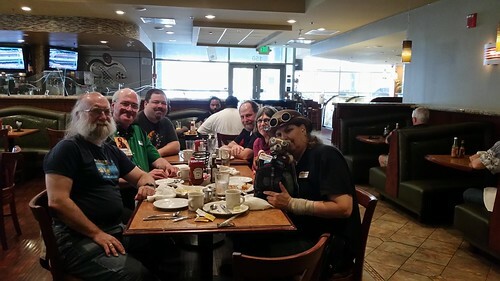 Earlier that morning, most of the WSFS division management (except Hugo Administrator Dave McCcarty, who had been up much of the night on Hugo Award business) went to breakfast at Flames Grill. It's the only day we'd have the time to do so. After delivering ribbons, it was off to the WSFS Mark Protection Committee meeting at 2 PM. 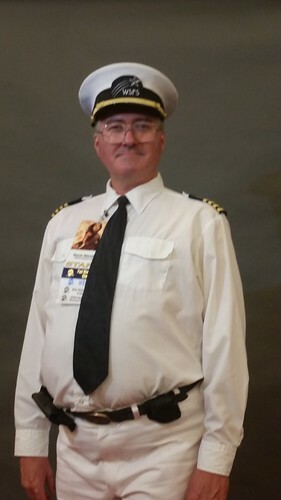 I then managed to sneak in a few minutes to grab some lunch from the concession stand, then head back to the hotel room where I changed into my WSFS captain's uniform. Here's a picture of me taken later that day. I was in uniform for the Opening Ceremony. I try to wear my Captain's uniform for Opening Ceremonies when possible. I was carrying the Gavel of WSFS, which I handed over to Andy Trembley to get to his husband so that Kevin Roche would have it for Opening Ceremonies. 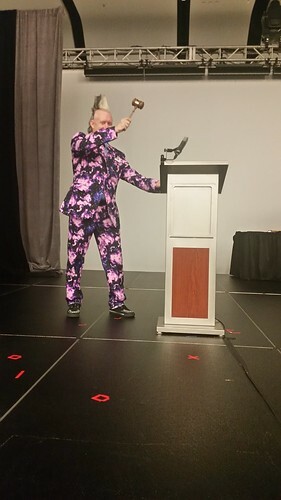 I got this photo (staged, I admit, because it's nearly impossible to get a good photo in real time) of Kevin calling the convention to formal order at the end of the Opening Ceremony. After the Opening Ceremonies, there was only a brief break before the Red Carpet rolled out prior to the 1943 Retrospective Hugo Awards. There people walked the Red Carpet and got their photos taken. If you'd like to see the photos, start here and work your way through my Flickr photostream. On the spur of the moment, I elected to live-tweet the Retro-Hugo results on the Hugo Awards Twitter feed, and I'm glad I did. 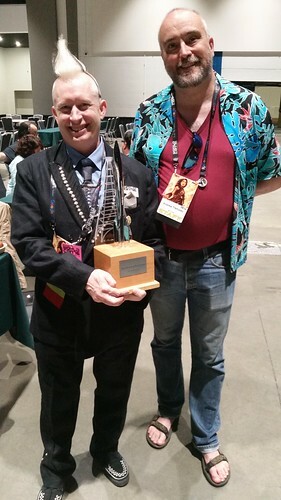 The results are posted at The Hugo Awards site. I took some trophy photos that I hope we'll have posted real soon now. No parties for me tonight. After saying good night to Kevin and Andy, I headed back to the hotel room in order to get the Retro-Hugo results posted and today's photos online. It was a bit frantic at times today running back and forth making sure everything in WSFS was where it belonged, but it looks like everything worked out. Tomorrow we move on to the Preliminary WSFS Business Meeting. I've had a look in Room 230 where the meeting will be held. There are still some loose ends that I hope we can get tied off before the meeting starts at 10 AM Friday.